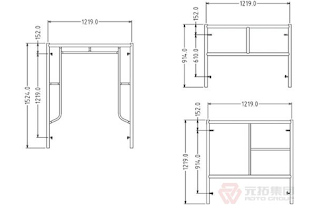 Along with the development of construction industry, scaffolding is also in constant innovation, bamboo wooden scaffold before since the 1950 s, 60 s steel pipe fastener scaffold, to the 80 s of the scaffold, gantry scaffolding and bowl round buckle (button) scaffold, etc, the new product emerge in endlessly. 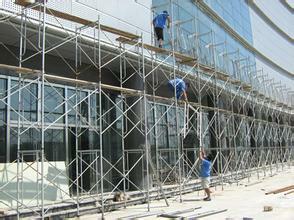 The following introduces the performance characteristics of all kinds of scaffolding products. Bamboo scaffold in the early days of the southern architectural market is a relatively common scaffolding products, the main characteristics is lightweight and flexible. But due to its characteristics of wood, bamboo scaffolding and fire resistance is poor, always brings to the construction engineering safety hazard, so the product is to gradually eliminated by the market. Steel pipe coupler scaffold is the alternative products bamboo scaffolding, its characteristic is to use the steel material, durable, and also strengthened the characteristics of the original bamboo scaffold erection of flexible, so since the advent of products has been favored by the construction unit. After steel pipe coupler scaffold is a steel scaffold material products, its main characteristic is to use a fixed type door structure for Mosaic, build-up method is simple, light equipment. But its complex structure, form a complete set of components is more, limited mobility, and because its material is steel pipe fastener scaffold to thin, product durability is a bit poor, so the market share is low. cuplock scaffolding is a steel tube coupler scaffold upgrade the product, its mainly for steel pipe coupler scaffold erection technology is complex, and fasteners vulnerable parts such as easy to lost, curing on the steel pipe will be connected parts, will be in the form of rotating bowl buckle lock steel pipe connection. Is characterized by the advantages of both the steel pipe coupler scaffold durable, at the same time the erection method is simple, because of its better material, is widely used in large-scale construction. ringlock scaffolding is the bowl after an improved product, which is mainly aimed at bowl bowl on scaffolding accessories vulnerability, the erection process requirement is more inflexible problem, has carried on the improvement of joint, adopts the model of disk and plug, simplifies the erection process, at the same time ensure that the erection of quality; The product since the marketing application get general recognition of the construction units, and gradually replace the bowl scaffold and the trend of steel pipe fastener scaffold. Construction industry is increasingly perfect, now bamboo wooden scaffolding phase, there is only a small building construction or civil building construction to use, and other scaffolding with their own advantages, a growing share of the market, new scaffold for the future development space is infinite.